Lithuanians is the only nation who preserved such a unique and symbolic baked treat as kūčiukai, says ethnologist Nijolė Marcinkevičienė. Today kūčiukai are more and more rarely baked at home so they lose their symbolic meaning. It is common that there is a variety of flavors of kūčiukai found on store shelves, however, they are very far from the traditionally baked Lithuanian goods. Therefore, according to an ethnologist, it's very important to preserve the true secret of baking traditional kūčiukai so that traditional recipes continue to be transmitted from generation to generation. "Kūčiukai are symbolic small bread cakes, which were intended for the spirits of the deceased. This is a unique baked good and even in such a small country as Lithuania we can count about thirty different names for it. In the past, each region of Lithuania and almost every family baked kūčiukai according to their own formula and called it by different names: džiovinukai, kutasėliai, kutkelės, buldikai, parpeliai and so on. These small baked pastries were made with buckwheat, rye, different mixtures of several crops. The dough contained not only poppy seeds but also linseed, hemp mash. In different Lithuanian regions the sizes and forms of kūčiukai were also different. These small pastries unite all Lithuanian people on December 24th, supporting the rituals of Christmas Eve supper" says ethnologist. N. Marcinkevičienė does not hide the fact that the recipes for kūčiukai has changed considerably in recent years. One hundred years ago kūčiukai were very simple, because it was fasting food - flour, water and a little bit of oil. Later, during the interwar period, people began to put the yeast so that they were softer, they also could already afford to add more oil, sometimes even butter. "Nowadays, the recipe for kūčiukai has changed considerably: we eat them softer, sweeter and more sweet-scented. It is understandable – people want to eat tasty food, but I would still prefer not to deviate from the traditional recipe so that this unique treat would not become just a delicious cookie. If we want diversity, we should take a look at the traditional recipes of kūčiukai and we will realize that there are dozens of flavors and shapes of traditional types of kūčiukai. You can also play with plenty of baking tips and tricks that will allow you to get the taste you want even with traditional composition" says the ethnologist. Laima Jankauskienė, head of quality assurance laboratory of the company "Malsena", which has been contributing to the saving of baking of traditional kūčiukai for several years, says that the most important thing is to choose the right flour. "If we use common wheat flour then we get solid kūčiukai. Also you would be successful in baking them with light spelled wheat flour. Those who want to eat more nutritious kūčiukai, I would offer to choose whole grain parts of spelled or wheat flour, which is rich in fiber. Whole-grain spelled kūčiukai will have a somewhat unusual color, but will surprise you with a delicate, distinctive taste. Whole grain wheat flour would be the most reminiscent of our ancestors baked goods" says the company's spokesman. Butter, milk and eggs are ingredients that people would not find in the traditional recipe of our ancestors kūčiukai, but they are liked by nowadays bakers because it helps you to get the desired texture and improve the taste. L. Jankauskienė recommends a few tricks that would help to achieve the desired result without overcoming the traditions. "People can achieve a certain degree of crunchiness and softness with different cooking methods. We will get soft kūčiukai if we make a dough with the usual wheat flour, allow it to rise for at least a couple of hours, and then, after the formation of cakes, it's necessary to wait another hour just before you put them into the oven. This way the dough will be more tasteful and flavorful. When cooking soft kūčiukai, they should be roasted as little as possible and, after removing them from the oven, they should be sprinkled with water. When cooking crunchy kūčiukai it is enough to raise the dough only after mixing it, and bake it a little longer" says L. Jankauskienė. Berta Garuckė, author of the blog "Cukrinis avinėlis", shares similar thoughts. Baking kūčiukai is one of the most important traditions for her family and the secrets of baking them are passed from generation to generation. "My grandmother always said that if you want softer kūčiukai, you should add more yeast. If you want them to be as crunchy as possible you need to add some oil. As well as if you would add more flour, the baked cubes would be harder and more suitable for soaking in milk. If you want to get a more pronounced poppy taste, then scald them with boiling water, strain them off and leave to dry before putting them into the dough. The dough itself must be soft, tight, but not too sticky. Also, when baking kūčiukai in a tin, you need to leave bigger spaces between them as they can stick together" says the blogger. B. Garuckė does not hide the fact that their family recipe for kūčiukai is a very sentimental thing. "One and only time I saw how my great-grandmother baked kūčiukai, and I still remember how my grandmother and mother were trying to learn her secrets. And at that moment I realized that this recipe is very important for the whole family. My great grandmother talked about her childhood, about her family's tradition of baking kūčiukai on Christmas Eve, about the time her whole family spent time in the kitchen while making them. And when you know this story, you understand how it is still important in these days. That is why I am very supportive on this "Malsena" initiative, which has been going on for a decade. This initiative fosters traditions and teaches children how to bake kūčiukai. And so I will try to teach my daughter the traditional way of making kūčiukai, so our family's recipe would travel from generation to generation" says B. Garuckė. 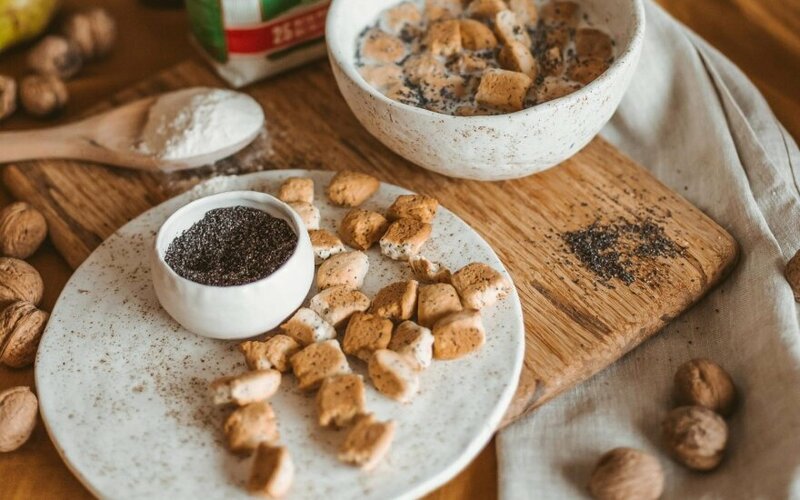 Ingredients: 200 ml of warm water, 400-500 grams of flour, 15 grams of fresh yeast, several spoons of poppy seeds, several spoons of sugar, a little bit of oil. Cooking: put yeast and sugar into warm water, mix these ingredients. Pour a portion of the flour and put it into a warm place so the dough would rise. Sift the remaining flour into a bowl and mix with poppy seeds. Once the dough has dried up, put the remaining flour, pour the oil, and add some more sugar. Knead the dough until it is not sticky anymore. Cover the dough with a towel and put it in a warm place, let it rise. Then sprinkle some flour on a large wooden board and put the dough on it, then knead it. Form prolonged pieces of dough, cut it into preferable slices. Place all the slices on a baking sheet and do not forget to leave spaces between them because they could stick together while baking. Bake for 10-15 minutes in a 180 ° C heated oven. Ingredients: 500 g of whole grain parts wheat flour, 250 g of water, 5 g of dry yeast, 75 g of sugar, 2 g of salt, 55 g of hemp seeds, 50 g of oil. 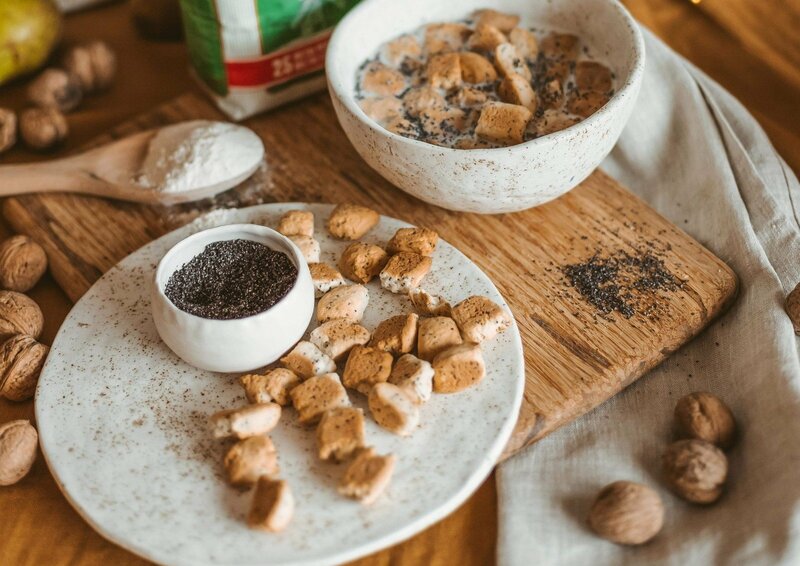 Preparation: pour room temperature water and the remaining products in the bowl in the following order: yeast, sugar, flour, poppy seeds, salt and hemp seeds. Mix everything until it is homogeneous. Pour oil and knead the dough until it is not sticky anymore. Cover the dough with a towel and keep it in a warm place for at least 2 hours. Put the dough on a floured surface. Cut the finger-thick dough strip and rotate your hands until you make a cord. Cut it in pieces about 2 cm in size, sprinkle it with flour and place it on a baking sheet covered with baking paper. Place the pieces 1 cm apart from each other. Cover the pieces with a towel, leave to rise for 30 minutes. Bake up to 220 ° C in a heated oven for about 10-12 minutes.